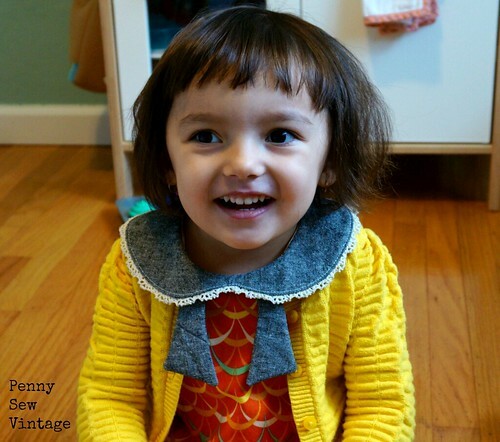 You guys, this collar! Am I right? I love it! She looks like she’s going to conquer the world in this top! I wanted to share this one with you in case you’re looking for a holiday/new year’s dress pattern with a vintage feel. 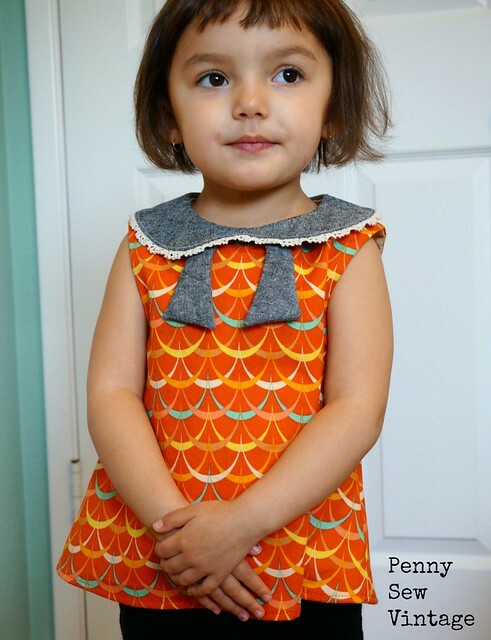 This is the Norah Dress & Tunic pattern by Mouse House Creations (I LOVE her sewing studio too). It’s not a new pattern, and you’ve probably seen versions around. It’s a simple dress to sew, the most time consuming part being the collar. 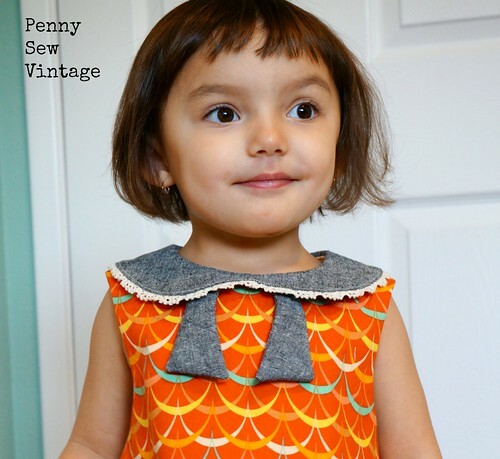 There are several options between top or dress, sleeves, and collar/tie and is available in sizes 6mos-12years. I chose the sleeveless tunic with collar and tie (I omitted the cincher for the center front of the collar) in a size 18 months. I decided to add some lace trim to the collar instead of piping, and I like the way it highlights the shape of the collar. 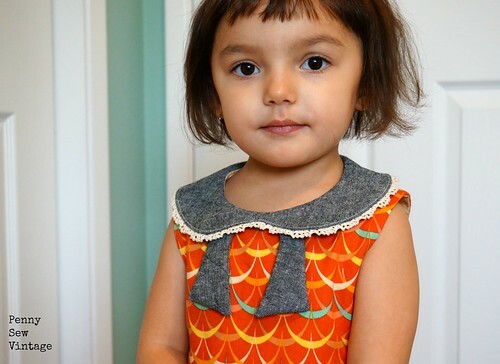 I really love how these fabrics came together too (orange is quilting cotton and collar is gray chambray), and they really looked good over the fall season. I think a new year’s dress with white or pink and gold would be fun! 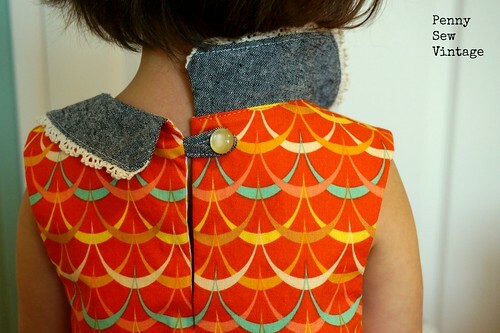 The back has a simple keyhole closure, and I popped on a vintage button. The inside has a facing which makes everything clean and finished looking. My only fit issue is the armhole which is rather large and falls very low on my girl (sorry no good pics of that). I would probably raise it at least 1″ on my future versions. For now with the cold weather, we’re layering it with sweaters. It still lets us enjoy that lovely collar! Still holiday sewing or knitting? I’m sure lots of us are, but try to relax and enjoy the holidays too. This year I’m trying really hard to spend more of my creative time involved with my girls, and letting them enjoy making things with me. It’s been sooo messy for sure, but also so much fun. We’re making those proverbial memories right?! In case I’m not back beforehand, happy holidays everyone! Aww! Thank you 🙂 She has definitely conquered my heart!